In keeping in line with recent posts on the subject of words and names in the world of superheroes, I give you this: a word of the week that accomplishes the difficult task of being both spicy-savory-tasty and undead-evil. salmagundi (sal-mə-GOON-di) — noun: 1. a salad plate of chopped meats, anchovies, eggs, and vegetables arranged in rows for contrast and dressed with a salad dressing 2. a food consisting of chopped meat and pickled herring, with oil, vinegar, pepper and onions. 3. any mixture of various ingredients; an olio or medley; a potpourri; a miscellany. Wiktionary and Merriam-Webster offer significantly different definitions. The picked herring one comes from the former and the salad plate one comes from the latter. I’ve never had the dish. If I see it on a menu, I’ll order it just to find out which of the two I’ll get. 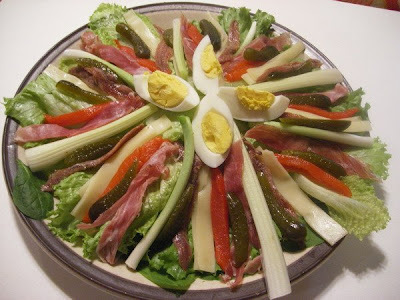 The Wikipedia page on salmagundi explains that the name actually doesn’t ever refer to a specific dish but instead “describes the grand presentation of a large plated salad comprising many different and disparate ingredients. These can be arranged in layers or geometrical designs on a plate or mixed together. The ingredients are then drizzled with a dressing. The dish aims to produce wide range of flavors and colors and textures on a single plate.” Furthermore, the entry seems to imply that the herring variation of the dish is a Jamaican thing. This I enjoy; as fun as the word is to say with an American accent, I think it being said by someone with a Jamaican accent would be even better. According to the Online Etymology Dictionary, the word arrives in English from the French salmagondis, “seasoned salt meats,” which in turn descends from the Middle French salmigondin, which was coined by the writer François Rabelais. The history goes further back, but I, for the purposes of this post, am more interested with the variant spellings of the word’s current form. 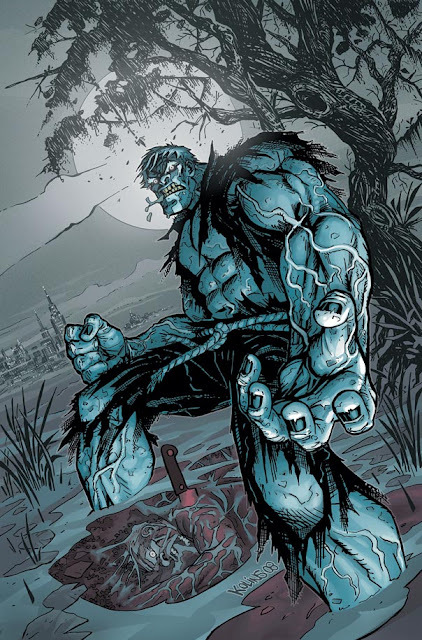 It can also be spelled solomongrundy or Solomon Grundy, which should be familiar to anyone who follows DC comics as the name of the hulking, shambling zombie villain. I guess it was someone who pronounces the last syllable of the days of the week “dee” and not “day.” Wikipedia doesn’t explain what, if anything, the poem has to do with dish, though it does claim salmagundi became corrupted to Solomon Grundy sometime in the 18th century. Worth noting in the context of the DC Comics universe — Grundy originally appeared as a foe of the Green Lantern and later caused trouble for Superman and Batman — is the existence of Washington Irving’s 1807 satire Salmagundi, which is most notable for coining the nickname Gotham for New York City, without which Batman might today be fighting crime in Huckleberry Village or some other less prestigiously named metropolis. There's a wonderful Edward Gorey version of the "Solomon Grundy" poem--I'm pretty sure it's a pop-up book, too--but lousy Amazon has no record of it. And one on the country's most esteemed literary journals, out of Skidmore College, is called Salmagundi. But what about the three wise men of Gotham? George: I would love to get my hands on this book. Shall keep an eye out for it. Nathan: Well, Gotham is also a city in England, though I'm pretty sure they pronounce the name differently than we do. I think Irving was just the first guy to apply the name to New York.